1. Why is moisture so important for the facial skin? Water plays a prominent role for a healthy looking skin. The horny layer contains about 10 to 30% of water, the deeper layers even more. Skin with optimal moisture balance is supple and smooth and has an intact barrier function. Insufficient moisture can result in rough and wan skin. Dry skin can also lose its elasticity and small micro-crackles can occur which can lead to impaired barrier function. Due to this, moisture is very important for a healthy looking, well balanced skin. NIVEA Face Care products help you moisturize and nourish your skin. 2. What is an effective care for dry facial skin? The best way to care for dry skin is a good balance of mild cleansing and a moisturizing and nourishing care. NIVEA products for dry skin are specially developed to meet those needs. You can find the skin type recommendation on the product. NIVEA Cleansing products for dry skin gently and thoroughly remove make-up and impurities. At the same time they are mild respecting skin’s moisture balance. NIVEA Care products provide the skin with intensive moisture and lipids. They support the skin’s own protective barrier and help preventing waterloss. Furthermore they nourish the skin for a smooth and healthy looking complexion. NIVEA offers special products for dry skin e.g. NIVEA Nourishing Day Care, NIVEA Indulging Cleansing Milk or NIVEA Gentle Cleansing Cream. 3. What factors could cause dry facial skin? The skin´s horny layer (Stratum Corneum) is covered by a hydro-lipid film. Together they form a protective barrier which is responsible for the protection from bacterial infections as well as the maintenance of your skin´s moisture balance. Damages in this barrier can cause skin dehydration . Both, external and internal factors, can be responsible for dry skin. External factors are climatic influences, such as wind, centrally heated air, low air humidity, high and low temperatures, and UV radiation. Furthermore, your personal habits also play a relevant role, e.g. the excessive use of aggressive cleansing products as well as some medications, stress, insufficient intake of fluids and certain dietary habits. In addition, internal factors such as hormonal influences, diseases or skin aging can be reasons for dry skin. 4. Why do I need to use special facial cleansing products? Cleansing is the first step in maintaining the natural beauty and healthy look of your skin. NIVEA facial cleansing products free the skin gently but thoroughly of make-up, sebum and impurities without drying it out or attacking the acid protective layer. They also respect the specific characteristics of the different skin types. The skin is optimally prepared for the follow-up care steps. 5. What can be done about large pores in the skin? The first step would be daily cleansing to remove the excess sebum from the skin with rinse off wash products followed by the use of a facial toner according to your skin type. In addition, a deep cleansing face mask or facial scrub 1-2 times a week could be used. Regarding NIVEA Face Care products, light moisturising products are recommended. 6. How often should I use a peeling product on my skin? For normal, combination or blemished prone skin a facial scrub can be used 1-2 times a week to boost the purifying effects of facial cleansing products. With a NIVEA Peeling product, sebum and impurities will be washed off gently but thoroughly and dead skin cells will be removed by slight mechanical processing on the upper skin layer. NIVEA offers special peeling products such as NIVEA Skin Refining Scrub or NIVEA Anti-Blemish 3-in-1 Cleanser. People with sensitive skin should not use peelings too often and need to ensure that the product is specifically suitable for their sensitive skin type. 7. What is the benefit of using a toner in addition to my face cleansing? Cleansing products free the skin gently but thoroughly of make-up, sebum and impurities. The new Micellar water helps, in addition, to gently remove water-soluble mascara. A toner particularly helps to purify your facial skin. It removes remaining residues, refreshes your skin and moisturizes. NIVEA Toner for dry or sensitive skin has soothing properties whereas NIVEA Aqua Effect Toner for combination skin provides a mattifying effect. Overall, it gives your skin a deeply cleansed and sensational fresh skin feeling. 8. What is the benefit of using a special eye care product around my eyes? The characteristic of the skin around your eyes is very special in comparison to other facial skin parts. The skin around and under the eyes is very thin and has weaker subcutaneous fatty tissue. It is very sensitive and reacts to changes within the body, especially changes related to the retention or distribution of water. Because of this sensitivity, the results of those changes can firstly be seen in the area around the eyes in form of e.g. dark circles or fine lines. 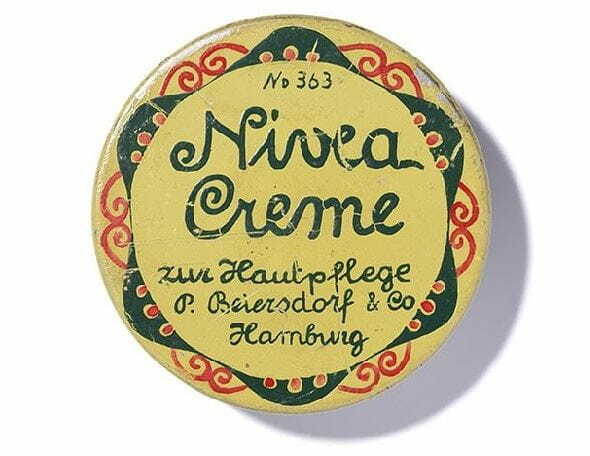 NIVEA Eye Care products, e.g. NIVEA Q10 Anti-Wrinkle Eye Care, are very mild and free of perfume and help to reduce the appearance of wrinkles and minimize dark under-eye circles for giving you a smoother and radiant-looking skin. 9. Why should a special night cream be used in the evening? In the evening and over night, when the skin is more relaxed, the regeneration process of cell division speeds up. For this reason the support of the regeneration process is the most important function for a night product as well as providing moisture and care. Therefore, the opportunity should be taken to provide the skin with particularly adapted creams. In addition to the greater regeneration effect of night care products, their composition differs from day care products as they do not provide additional UV protection, which is not necessary overnight. 10. What causes my skin to age prematurely? There are various reasons that influence premature ageing. The most important factor is UV radiation in sunlight but also other external influences as an unhealthy lifestyle or psychological stress can have an effect on premature aging. These factors provoke the increased formation of free radicals in the skin which are the major cause of premature skin ageing. 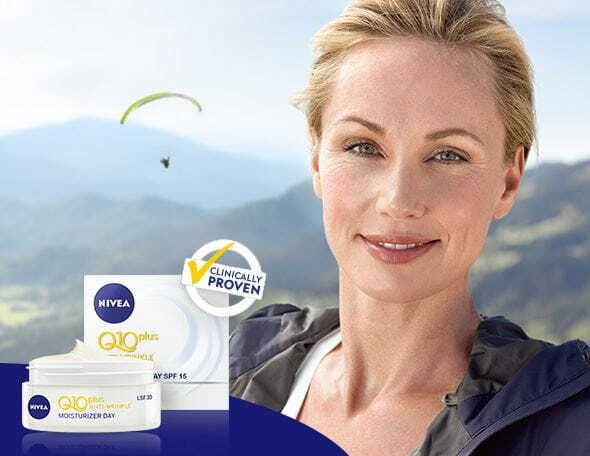 NIVEA offers special face care products with a SPF, such as NIVEA Moisturizing day care with SPF 15 or Q10 Anti-Wrinkle Day Care with SPF 15 or SPF 30. 11. Should a day care product have sun protection properties? The primary stress factor for premature ageing of your skin is UV radiation in sunlight. Therefore, NIVEA Face Care products with UV filters can help to reduce the UV light influence on your facial skin. In general, the main effect of a moisturizer is to increase the moisture content in the skin what will make the skin look fresher and more relaxed. A moisturizer which contains UV-filters, additionally protects your skin against UVA/UVB rays. As the protection levels vary for the different NIVEA Face Care products, always check the packaging notices for the exact SPF of the product of your choice. NIVEA Face Care products with SPF, e.g. NIVEA Moisturizing Day Care with SPF 15, protect your skin from daily sunlight. In case you require special sun care products e.g. when going sunbathing or swimming in intensive sunlight, our specifically developed NIVEA Sun Care products will be appropriate for you. 12. Is it necessary to use different skin care ranges at summer at winter time? Facial skin conditions can vary depend on seasonal changes. In winter, the skin normally is dryer compared to summer time. Even though the skin type can vary during the year, the changes in the skin´s behaviour can be of minor or major extent. If you found a skin care range that optimally cares for your facial skin throughout the year , there’s no need to switch to another product range. Nevertheless, if you feel your skin is not cared enough or lacks sufficient moisture, it makes sense to use a more rich and moisturizing products, like e.g. NIVEA Moisturizing Day Care or NIVEA Nourishing Day Care in wintertime. 13. What does 'non-comedogenic' mean? Products are called “non-comedogenic” when they are proven not to block pores that could develop into comedones. Numerous factors can play a role in the formation of blackheads. A potential factor is excess sebum which leads to a clogging of the sebaceous glands and thus stimulate the skin to form blackheads. Non-comedogenic cleansing and skincare products are specifically for blemished prone skin (mainly oily and combination skin).